As a result of the now late Kepler space telescope, researchers are able to discover worlds beyond our solar system. The latest discovery concerns the Kepler-47 binary star system and includes discovering a third planet within its system. Researchers used data from the Kepler space telescope, and led by San Diego State University, unveiled a Neptune-to-Saturn-sized planet which orbits between the two planets already discovered. Since researchers started looking for exoplanets, Kepler-47 is the only known multi-planet binary star system. Circumbinary planets are planets that orbit two stars at the same time. Researchers used the “transit method,” on the Kepler space telescope to discover the planet. That means that the planet is discovered when passing by its star and it temporarily blocks or dims its light. The new planet, which researchers called Kepler-47d wasn’t detected earlier because of the weak transit signals that were detected. However, the 3rd planet in the binary star system baffled scientists, given the size and its location. It’s the largest of the three planets, yet it’s located between two, smaller planets. According to William Welsh, a SDSU astronomer and co-author of the study, Orosz and he expected to discover an additional planet which would orbit on the exterior side of the previously discovered planets. “We certainly didn’t expect it to be the largest planet in the system. This was almost shocking,” Welsh said about the study published in the Astronomical Journal. Thanks to the discovery of the 3rd planet in the binary star system, researchers could have a better understanding of the system. One of the first information researchers got is that the planets in this particular circumbinary system have low density, even less than Saturn, which is the planet in the solar system with the lowest density. 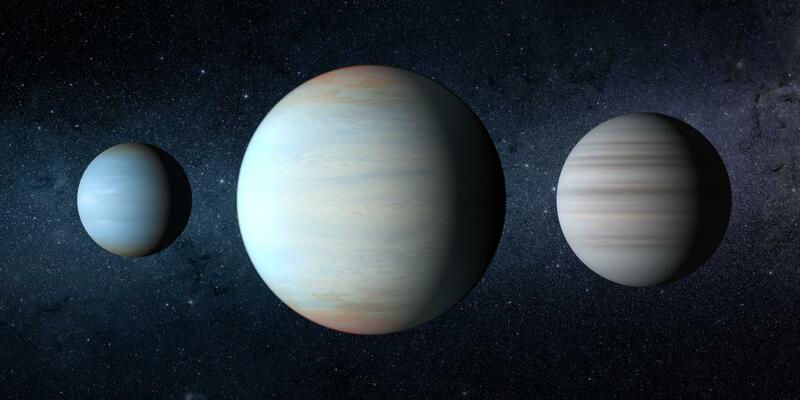 While the low density for hot-Jupiter-type exoplanets is not unusual, it is rare for the mild-temperature planets such as the third planet in the Kepler-47 system. The equilibrium temperature of Kepler-47d measures roughly 50°F while Kepler-47c measures 26°F. The inner, middle and outer planets measure 3.1, 7.0 and 4.7 times the size of Earth respectively and can take 49, 187 and 303 days to orbit their stars respectively.